The Eura R is a dual purpose natural smoke and heat exhaust vent (NSHEV) louvre for roof or wall mounted natural Smoke & Fire Ventilation. Suitable for smoke & heat release and day-to-day environmental use. Suited to applications where continuous ventilation is required together with the feature of opening the large area of louvre blades for increased ventilation or emergency smoke & heat release. 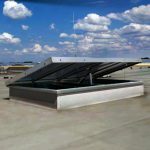 Aerodynamically designed to maximise efficiency the units are suitable for a wide variety of applications ranging from industrial/commercial buildings to shopping centres and atria. Full independent product testing including opening mechanism, operational reliability, wind load, aerodynamic efficiency, mechanical integrity, environmental & fire performance all conforming & certified to EN 12101-2 specification..
Aerodynamic coefficient of top louvres 0.60 – 0.62 dependant upon size – refer to brochure above. The louvre blades and dampers are fixed with weatherproof sealing tape and energy strips to minimise draughts and heat loss when the blades and side dampers are in the closed position. The Eura R is also available with insulated blades or translucent polycarbonate blades. 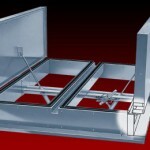 Insulated side dampers are also an option. 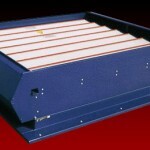 Units are available in throat sizes ranging from 600mm wide x 980mm long, up to 1800mm wide x 2920mm long. Corrosion resistant AlMg3 aluminium alloy with corrosion resistant bearings. 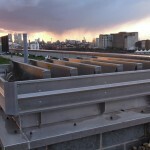 A wide range of options are offered using differing body, louvre blade and side damper constructions. In addition to mill finish, also available is a polyester powder paint finish with a wide choice of colours and gloss levels. Pneumatic or Electric Actuation Enables connection to Life Safety, Smoke Detection and Building Management Systems.